The wonderful Ruby Wax joined the PUSH team for Mental Health Awareness week to deliver a hilarious and insightful talk for our clients over at Havas. Following her hugely successful career with BBC television as an interviewer and comedian, Ruby turned her attention to the study of psychotherapy and neuroscience, graduating from Oxford University in 2013 with a Masters’ degree in Mindfulness Based Cognitive Therapy. We welcome this collaboration because Ruby offers a down to earth, practical, funny and, ultimately, digestible insight into mental health and mindfulness-based stress reduction techniques. Her trailblazing work in challenging perceptions of mental health issues synergizes with our philosophy at PUSH. We’re looking forward to utilizing her wealth of experience and knowledge to help our clients. So, what did Ruby have to say about our relationship with stress and what’s the antidote? Back in the day, no one died of stress, more likely we died of bad teeth or a spike to the head. In fact we welcomed stress, it quite literally kept us alive and out of danger. Caveman confronted with saber-toothed tiger equals distress signals to the brain and an activated sympathetic nervous system, pinging them into ‘fight or flight’ mode. Cortisol and adrenaline were released, the heart rate increased, blood pressure and blood sugar rose and – boom – they were given a temporary burst of energy and strength to get the hell out of there. Fast forward to today and our lives are very different. No more saber-toothed tigers but instead we have difficult clients, pitch presentations and deadlines but we have exactly the same brain! It’s the sheer volume that is the real problem. The constant triggering with little time for respite or recovery results in chronic stress and this is a major factor contributing to mental and other health issues. We invented computers to make our lives easier so we could have more fun and let the computers do all the work. Now we are all pretty sure that computers will get the last laugh. “In the future computer robots will put our poor mortal human heads in snow globes and give it to each other for Christmas”. Can anyone say their lives have been simplified by this growing interconnectivity? The ‘always on’ mode that technology facilitates adds a layer of virtual stress that simply didn’t exist in the past. Add to that the proven addictive quality of the various social channels, apps and devices we are all enthralled with and it creates a perfect storm for triggering mental health problems. Memory, concentration and focus are the first casualties. We are all striving for the present moment. We spend time and money investing in luxury holidays, the expensive wine and other material acquisitions and yet are fundamentally unfulfilled. We crave it and yet all too often miss the moment because our minds are elsewhere. While you may physically be on a beautiful sandy beach with a cocktail in hand, if your mind is revisiting the people, politics and pressure of office life you are wasting your annual leave. We’re so incredibly excited about this partnership and have a lot of plans in place. Watch this space for how this partnership will unfold next! 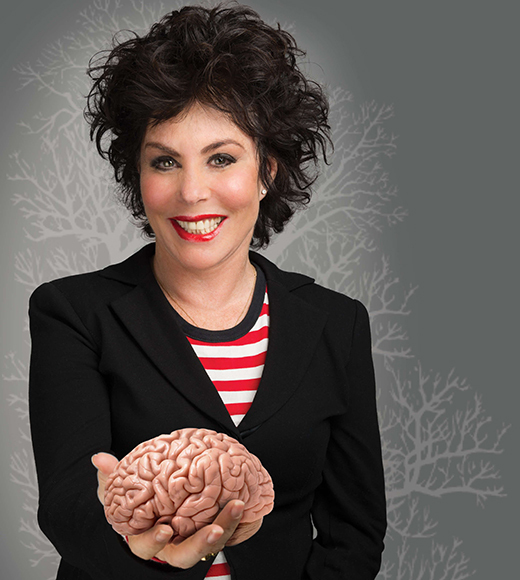 Ruby Wax explains more about how mindfulness and cognitive therapy gives us a chance to manage our stress in her books, ‘A mindfulness guide for the frazzled’ and ‘How to be Human’. Talk to us about mindful brain training for your company – get in touch.